June 10th 2011, the day my baby brother (well brother in law) got married! The day started off really badly, C came into our bed at 2am after a nightmare, LissyLou woke at 4am needing a feed and I got up at 5am due to a very very painful blocked milk duct. I toddled downstairs and caught up on my soaps (god bless Sky Plus) whilst I sat with a hot water bottle on one side and a breast pump on the other! I got the children up at about 8am and started getting them breakfast and making sure we had everything we needed for the day then LissyLou and I went to join the bride and the other bridesmaids so that we could all get ready together. Cue Champagne and pastries for breakfast and makeup everywhere you looked. 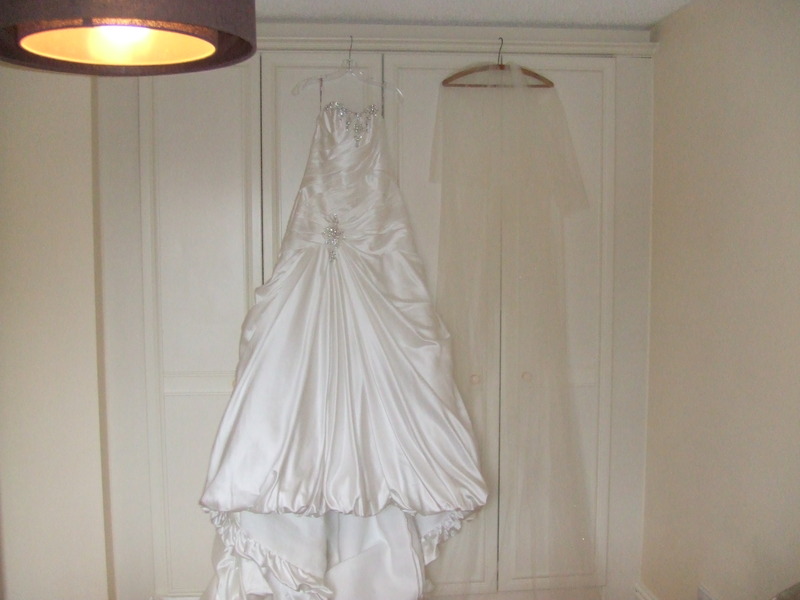 The crying started the minute I saw the brides dress hanging in front of her wardrobe and pretty much carried on for half the day! The bride looked stunning, she wore an all white satin Maggie Sottero gown with crystals and a cathedral train dotted with diamantes! WOW. The bridesmaid dresses were teal, one shouldered and accompanied with an orchid wrist corsage. We all wore our hair in a low side bun and had gold and green eyeshadow. It was a beautiful dress and I felt very comfortable even though it was only 4 months after my csection. LissyLou wore a beautiful little cream dress and I made a headband to match complete with teal butterfly, so she might not have been a bridesmaid but she looked the part. The cars were vintage Rolls Royce limos, the bridesmaids and the mother of the bride all crammed into the first one and the bride followed with her dad, all the bridesmaids welled up as we got near to the church and heard the bells, and we cryed our way down the aisle. The service was lovely, the whole congregation were in tears when the vicar talked about how my brother thought this day would never come. (Perhaps I should explain that two years ago he was involved in a road traffic accident and he eventually lost his left leg. It was very touch and go whether he would live for a while, and he struggled for months trying to keep the leg but in the end he made the horrendous decision to have it amputated below the left knee). So it’s fair to say that he is an amazing, strong individual and we all knew how long this day was coming. We spent 1hr outside the church taking photos before heading off for the reception. My mum had been looking after both children up to this point and then it was our turn. Poor C was so stressed out and unhappy, he hadn’t wanted to put on his suit, and so in the end he went in the trousers, shirt and waistcoat. He didn’t want to sit down and eat his meal, preferring to run around and play with his cars on the floor. I didn’t mind too much, except when he was threatening to trip up the poor waitresses and spill bottles of wine, so by the end of the starters I was so stressed I could hardly breathe. He did eat some fruit and ice cream but was not interested in his main course, so for once we let him off. I underestimated how hard it would be to keep him calm in such a stressful and controlled situation wearing a dress that wasn’t condusive to crouching etc. Then came the speeches, the father of the bride did well, he is not known for his speaking, and he was very sweet about his daughter. C was playing while this went on and found the second microphone. He picked it up and was talking into it, fine until he realised he could switch it on and all of a sudden he shouted MICROPHONE!!!!!!!!! The whole room was in stitches. My brother’s speech was AMAZING, he had a small card with bullet points and he talked eloquently, with such emotion and love for nearly half an hour. His love for the bride, and how he thanked her for getting him through the last two years was so beautiful and uncharacteristly ‘soft’ for my tough guy brother. Now anyone who knows me knows I hate to be away from my children but I have never ever been so relieved as when my mum came to pick them up. Finally I could get to enjoying the rest of the night! And what a night, lots and lots of dancing, a bit of wine and a great band! They had everyone up on the dance floor, singing our hearts out, I don’t have much voice left now! The cake was a tower of Krispy Kreme doughnuts, all my idea, and it went down an absolute storm! It was such a magical day and perfect for my brother in law and his bride. I love Think Baby! Its a a great site for mums. Full of useful advice from trying to conceive, pregnancy, babies, toddlers and family. It offers useful reviews of all things baby/child by linking to its parents site Made for Mums, competitions, and most importantly for me FORUMS! I joined Think Baby when pregnant with C, hoping for some guidance through the minefield that is pregnancy and motherhood. Mums (including expectant mums) post about anything and everything to do with having babies, raising babies and family life! I started posting on the Think Baby Due March thread and met the best group of ladies you could ever wish to meet. We all live miles apart and come from different backgrounds but I’ve made some friends for life. Its lovely to see how their babies have grown and to watch their lives unfold, admittedly mostly through Facebook. One of the ladies had another little boy just before I had LissyLou, one just had a little girl and another 5 are pregnant! We are a fertile bunch! Think Baby runs some awesome competitions, both through their website and through their FaceBook page. The best thing I have ever won was a £50 Mothercare voucher for being a ‘Supermum’, I put a tip on thread about keeping babies cool in summer, one of my friends nominated me as a Supermum and other mums voted for my tip to win. I was so chuffed! But regular competitions have given me loads of little bits and pieces, especially recently! Think Baby post regular stories about celebrity parents, fulfilling two of my NEEDS, mummy talk and celebrity news! I love to know what the latest celebrity parenting trends are! If you are looking for great information, tips and to make some good friends then Think Baby is for you! Well the suits have arrived…. but yes you’ve guessed it what a nightmare! All the men/boys were ‘measured’ by the sales lady and the waiscoats are all HUGE, jackets don’t fit and the groom was most stressed out by it all. The 3 men that tried theirs on whilst I was there all need something changing and one of the waistcoats had a broken button. C tried his on to huge protests, I hope it was just that he was tired and not an indication of how he will behave on the day. But he looked possibly the most adorable I have ever seen him. There is something about a toddler in ‘tails’ that could melt the coldest heart. He has exactly the same as the men, including the tie, waistcoat, shirt and full suit! Then we went to buy a sandpit. Found one second hand on Netmums, so it was £20 including sand. C loved it so much, that we had hysterics when it was time to get him to come in for bed. Its by Step 2. Its a great height for toddlers, C could reach it easily and I think it will last him until he is about 4. It doesn’t need loads of sand either, we have only put one bag of play sand in it and I think its enough as this way it won’t get spilt as easily but it could easily take the 40lbs stated by Step 2. It has a lid that fastens on for when not in use so this should keep the sand clean and dry. Having seen it in action I think it is a fair price brand new, it is good quality, sturdy and a good size. hope we get nice weather so C can use it now! !